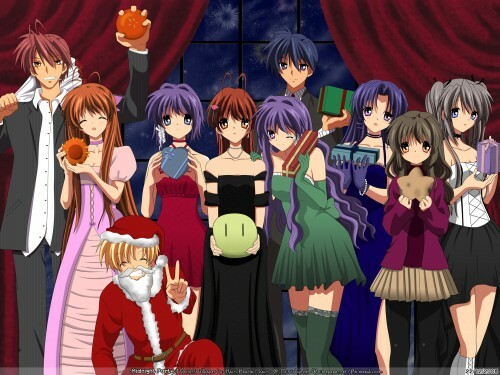 Minitokyo »	Clannad Wallpapers » Clannad Wallpaper: . :Midnight Party:. BIG big description ahead!Sorry about that! I did a quick sketch of everyone's outfits and stupid background. Yes, never mind the ugliness of that sketch, I've only started using my tablet recently. About the presents they're holding...That was the main idea of this whole Project. When I first thought of using this scan for Christmas, I essencially thought of changing from bread to presents. The clothes and hairstyles came a few minutes later. Akio-san & Sanae-san: I couldn't leave Sanae-san's bread out! She's so proud of it, after all. Made Akio hold a bouquet of roses, since it was perfect for this setting. His outfit isn't that creative, it's pretty cliche, but I really couldn't see him wearing another thing. Too tired to make a proper pinstripe, so I used patterns. Sanae-san...since she is into theatre as well, I thought a weird dress like this would actually be fun. Let her hair lose since she's much prettier that way. Sunohara: Oh good ol' Sunohara :nya: He looks so happy that a smile appeared on my face while vectoring him. There had to be a Santa! And who's better than him? Ryou:I loved how her hair turned out. Added a simple red dress with a ribbon and done. Her present is like one of those chocolate boxes. A round one like the melon pan she was holding was boring. A heart shaped box is much more romantic. I personally think she turned out really cute. Kyou:Dear Kyou had to have wavy hair. I always wanted to see how she looked like that and honestly, it's not that different ^_^' A simple dress with some frills and gloves, done. I also added laces in her stocking, even though it's not that visible since it was resized to only 25% of original size. She was the hardest, I had no idea how to color wavy hair, and not sure I like green on her. Tomoya: Oh look! Tomoya's there too. Wow, he's like...hiding! XD I didn't think it was worth changing his hair or outfit since he isn't that visible. Tomoyo:...was my victim. Twintails + Corset. I love corsets and all those baroque clothes but I couldn't really make something like that here, Sanae-san was enough (and she has excuse). So I added a kind of different skirt to go along the corset. That skirt was difficult to color too. I think she looks really different from everyone, but somehow, she doesn't look out of place. It's already a really big description...I don't think there's much more to say. Hope everyone loves it! And C&C is extremely welcome, as I spent a lot of effort on this! That was my reaction when I first saw this! I'm dying! It's amazing! It's true Kyou doesn't look that different with wavy hair :o But it's nice. And I adore how you designed her outfit. Cute dress, long gloves, thigh high tights (with wow detail) and I think I love the gradient on the dress the most! The earrings also catch my eye. And your Tomoyo...omochikaeriiii! Ha ha. She looks so darn cute. I'm ready to demand a vector of just her looking like that! (But I won't :P) The twin tails with the outfit and the pose...I love it. I can't get over it. Wow. All this and I haven't even gotten to the background? Great job with the curtains. I never would have thought to add a floral pattern like that but it's surprisingly fitting :o And the fireworks and stars are beautiful. anyway this is so perfectly done and omg how do you have so much patience! Wow, this has to be the best of all your works so far. and styles of hair, it's such a twist on things. the vector is, all the work and effort is really shown. It's very beautiful and you should be proud of it. You must really have had a lot of work with this! But it totally paid off! *hugs kairi* now i really have to make you something amazing since this is just awesome! clean lovely lines and their outfit changes are totally worth every minute--at least i think so and yes put that tablet to good use. wow..wow ^^ this is absolutely beautiful! 20 faves in 2 hours! Congrats! This is awesome, Kairi! I've seen the sketches & outlines before, and the real stuff look much better! Great job! thats' that's....how did you do that? :O it's AMAZING. You edited the original pic so freaking flawless! The hairstyles and clothes are so creative! Sweet MAMA! This is awesome. The same reaction as ash's and yoru's one. You've got a set of patience to vector all these characters but in the end it was all worth it because they look amazing. I like them all and thus refuse to choose a favorite. Lovely work and beautiful wallpaper, thanks for sharing it! I saw this wallpaper in AP but I decided to leave a comment here. I've to congratulate you on making such lovely transformation: I saw the scan and what you did here is simply amazing! The vectoring, the background, the colours... are great. It must have taken you a lot of time to make this wall! Changing clothes are really match with background. It's hard work but you did it very well! Can be better, but still nice. hi there, I see it posted on http://www.sosg.net/read.php?tid=234472 , hope you don't mind..
Wow! I never have seen a creation that has the outfits all altered...I commend you on a job well done! Wow! The vectoring is great! And I like the background, especially the window!